I was out in Bayside for work the other day and when lunchtime hit I absolutely starving! I wasn’t in the mood for my usual healthy salad- I needed something with some sustenance. I needed something with some meat! Voila! I found Three Brother Butchers and my prayers were answered. I got three tacos each stuffed with a different kinds of meat- pulled pork, brisket and pulled chicken. They were all fantastic I have to say. The chicken had a crusty charbroiled skin, the pulled pork was super moist and the brisket was so incredibly smoky I almost felt like it was still cooking on the grill. I mean this brisket had serious smoky flavor. Then they topped off all of the tacos with a mound of coleslaw and gave me some spicy mayo and side of BBQ sauce for dipping. For $5.95 this lunch deal is pretty hard to beat. The only thing I wish is that the coleslaw would have a bit more flavor. Even offering a vinegar based coleslaw would work well with the juicy pulled pork. 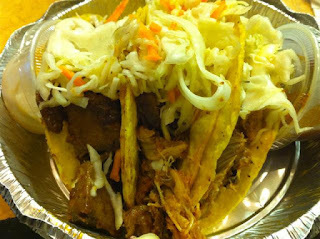 However these tacos were pretty close to perfect and the friendly staff just made it an all around great spot for food. No more salads for me in Bayside- Three Brothers is where it’s at!